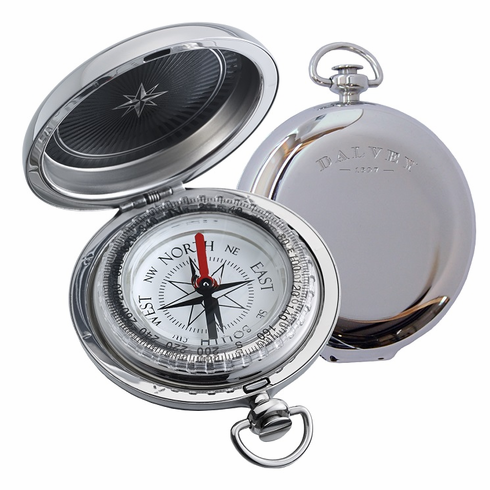 This new pocket compass from Dalvey has a smoother front face and a stylish compass rose on the inside lid. And the back side is still completely smooth. Now you have both a front and back side suitable for engraving. This pocket compass from Dalvey allows today's traveler to explore with confidence and style by combining elegance and fine workmanship with a high quality compass. The perfect gift for an accomplished executive, or a new graduate just beginning life's adventures. The liquid filled capsule features a tungsten steel needle on a jeweled bearing. Around the capsule is a rotating azimuth ring with 2 degree resolution. The capsule is set in a precision made, non-tarnish stainless steel body. The highly polished stainless lid features an engraving area below the Dalvey logo, and folds into a pocket-watch style fob. The back side of the compass features a smooth polished surface suitable for engraving an entire message or phrase. Engraving services are not available through The Compass Store. Please see your local engraver for an assortment of engraving capabilities on stainless steel.